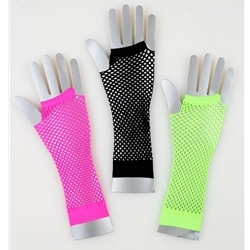 The 80’s Fishnet Gloves include one pair of Gloves as pictured which come in Pink, Black, or Green based on availability. These gloves are available in Adult One Size Fits Most. Fishnet clothing was an iconic mainstay of 80’s fashion. Great for a rock and roll, metal, or punk look, Fishnet Tights pair well with Fishnet Gloves to really provide a retro appearance. Sleeve up these fabulous gloves for a night on the town, an 80’s theme party, or for Halloween!